Austine at her light table. Polage is an art form invented by Austine Wood-Comarow in 1967. This colorful artwork is created with no pigment of any kind. Just as a prism breaks white light into the pure colors of the spectrum, Austine’s materials — cellulose and polarizing filter — break up light make up her palette. Without a lightbox or a polarizing viewer, a Polage might look as it does at left — areas of color, but mostly gray, like etched glass. But dramatic changes appear when you view the piece through a polarizing filter or place it in a special motorized lightbox. Instantly, the Polage comes to life. All the colors of the rainbow make up each intricate image. It morphs gently, the colors’ change giving you a continuous flow of imagery. Polage is painting with light, but the method of making these works of art is more like sculpture. Each piece is painstakingly hand-built, capturing light and structuring its changes into images that relate to and complement one another. This multidimensional aspect of Austine Wood Comarow’s work brings a third dimension of meaning into the work in time, rather than in space. Museums all over the world have commissioned and collected Austine’s Polages including: The Boston Museum of Science, La Cite des Sciences et des l’Industrie, Paris, Technorama, Switzerland, Singapore Science Center, Great Lakes Science Center, Cleveland, and Disney’s EPCOT Center in Orlando. Austine Wood Comarow invented a new art medium in 1967 when she discovered that crumpled clear cellophane between two polarizing filters suddenly became brightly colored "jewels." 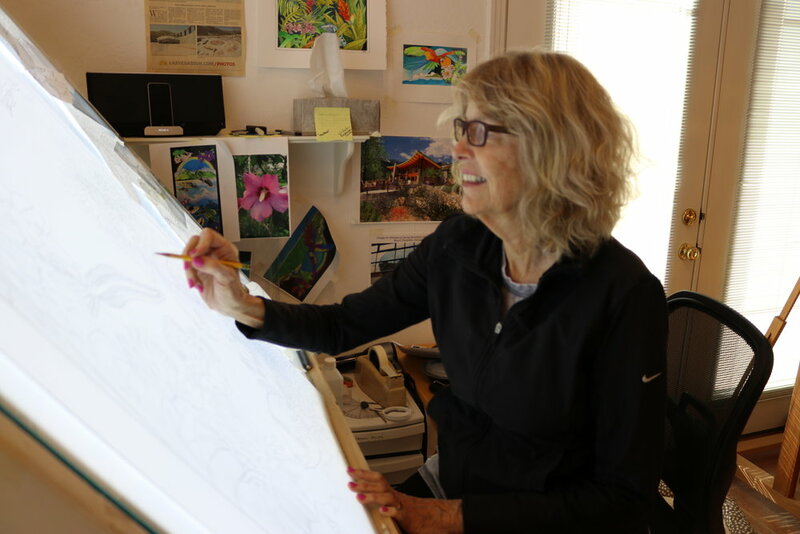 She's spent about 50 years perfecting this new art form, learning to control the colors and create figurative images. She calls this polarized light art "Polage®". The art in many of her works continually changes by means of a motorized rotating polarizing filter behind the piece. Some works change by using a special liquid crystal device. Still others magically appear out of invisible panels of light when viewed through a polarizing filter. Most of her work is back-lit and appears much like stained glass. Some of her work is reflective, images jumping out of a metallic surface. In 2009 the Lakeview Museum of Arts and Sciences in Peoria, Illinois presented a retrospective showing of the life work of Austine. Curator of the show, Kristen McKinsey discusses the work. This show was made available to Smithsonian Affiliate museums through the Lakeview Museum. Read a Physicist's Presentation on the Physics of Polage Art, specifically the science of light itself that Austine makes use of in creating her pigment-less, colorful artworks. Austine sketching at her light-table. Austine at work using the materials she combines to create Polage Art. The piece she's working on is for the Montgomery Museum of Fine Arts who had commissioned Austine to create an interpretation of a large painting in their collection called Cazador de Nubes by Edgar Soberon. This is the second "interpretation" Austine has created for the MMFA. The first was over 20 years ago: an interpretation of a painting by Charles Sheeler.